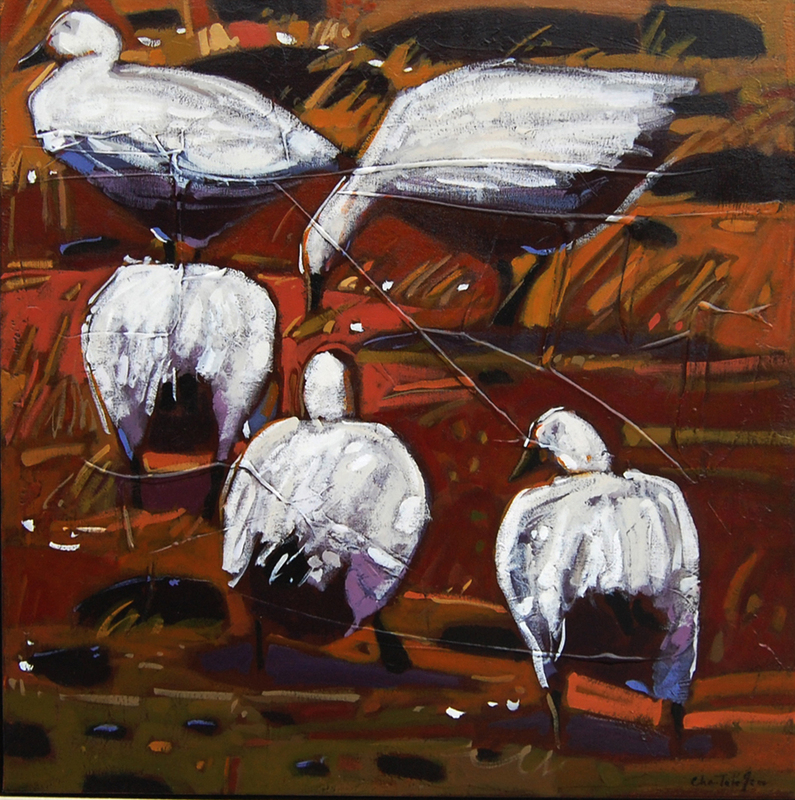 Mesmerized either by a gaggle of geese or tufted ducks cavorting on a pond, Chantale Jean makes her public aware of the strength and frailty of the many realms of the universe. Driven by a feeling of being part of a quiet universe exuding calm and harmony, or by the urgency of a collective confrontation between an individual and a group, Chantale Jean acts like a producer by directing her characters and even dialoguing with them. Each painting becomes a silent piece of poetry which appeals to the spectator. Even, if the lyrics seem muted, the artist isn’t silent when voicing her admiration for Nature or defending it . Through art, she shows her commitment and position herself against those who would destroy all things for profit. Her sense of humor always shines while she’s experiencing great pleasure directing her character. Through the energy of her works, the combined figuration and abstraction never fail to impress the onlooker and make him experience feelings other than those savored by the artist. The quaint range of her hues enhances the plasticity of her paintings and takes the spectator into her personal and unpredictable scenario. Chantale Jean sensational creations are made of many colored but silly characters. Wild headings build up each presentation and take the public into her own ever-reinvented world.